The Corinthian Society SaraPath Diagnostics® has been a member of the Corinthian Society since 1999. The Corinthian Society is comprised of individuals, corporations and foundations having made cumulative gifts of $5,000 and more to the Healthcare Foundation. 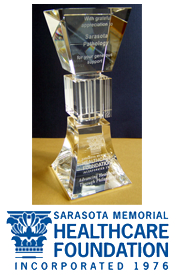 Corinthian Society members are recognized for their support by various donor recognition programs located on the campus of Sarasota Memorial Health Care System. In June of this year, one of our pathologists, Dr. J. Robert Spencer was recognized for his visionary leadership & corporate partnership within the Foundation. Dr. Spencer was presented with an award for his continued support & extended an invitation to the Foundation's Partner's in Health programs.